With unrestricted mountain views, this hotel is situated in the centre of Courchevel, with direct access to the ski slopes. It features a hot tub, a sauna and a hammam. 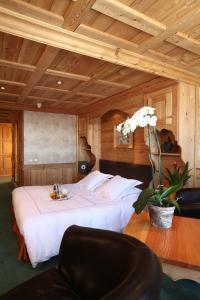 The chalet-style rooms at the Pomme de Pin are spacious and some have panoramic mountain views. Each is equipped with free Wi-Fi access and satellite TV, and bathrobes and slippers are provided. The hotel La Pomme de Pin has a restaurant with a large south-facing terrace overlooking the mountains. There is also a panoramic bar. Additional facilities at the Pomme de Pin include a covered car park and a 24-hour reception. Massage treatments are also available.